The Ruesterholz Admissions Center is located within a 19th century house that over looks the Manhattan skyline. The changeable, interior-lit, floor-to-ceiling mural is visible from the exterior. 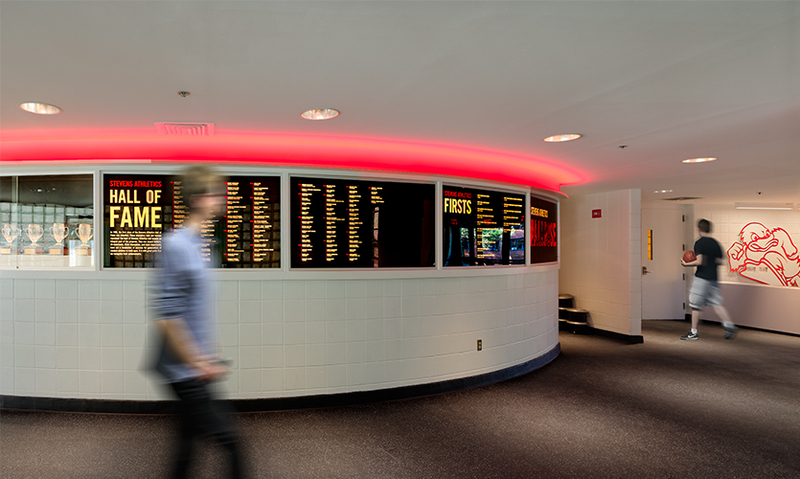 The exhibits and wall graphics highlight Stevens history, current student life and notable alumni. The touch screen edges were covered in white vinyl and framed with lightblock material, maintaining the airy, floating look of the exhibits. 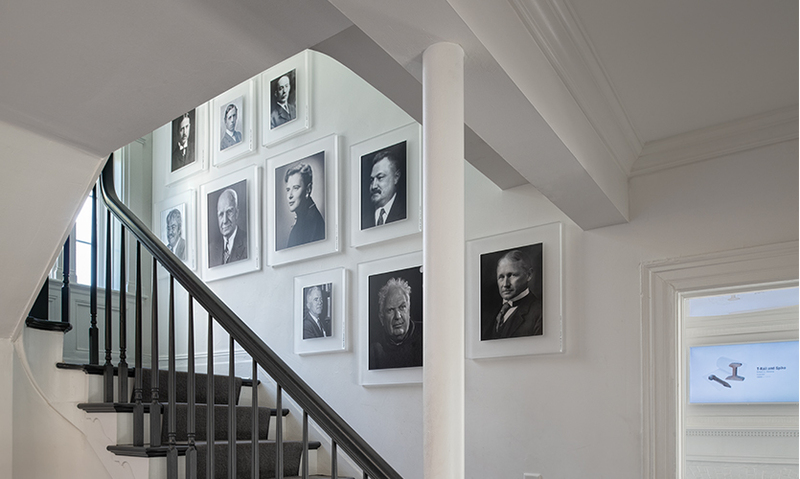 Portraits of notable Stevens alumni are displayed in the stairwell, adding to the narrative while integrating into the homelike space. Floating frames in the stairwell were fashioned from lightblock and labeled on the edge. 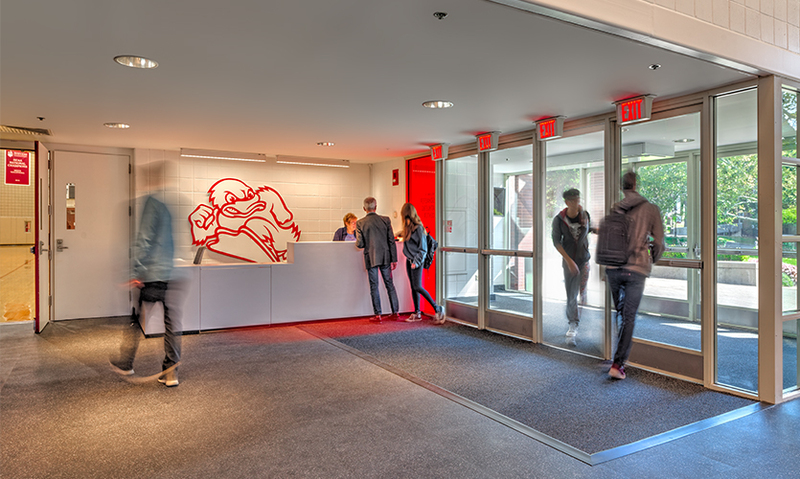 Unique artwork was developed for each interview room symbolizing an iconic creation of Stevens Alumni. The Internet Message Access Protocol (IMAP) room is where remote candidates are interviewed via Skype. The sculptor Alexander Calder—famous for his kinetic artworks—attended Stevens. The inventor of Bubble Wrap is honored by one of the interview rooms. 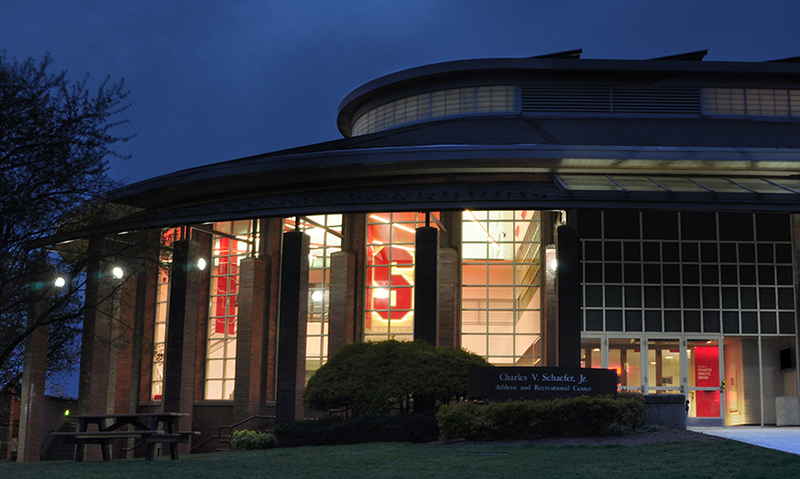 New graphic treatments are visible through the large windows of the Schaefer Center Gymnasium. The Spagnola team specified new flooring and furniture in addition to branding the space. "Attila" the duck springs into action. The atrium has been completely transformed by a few strategic design choices. 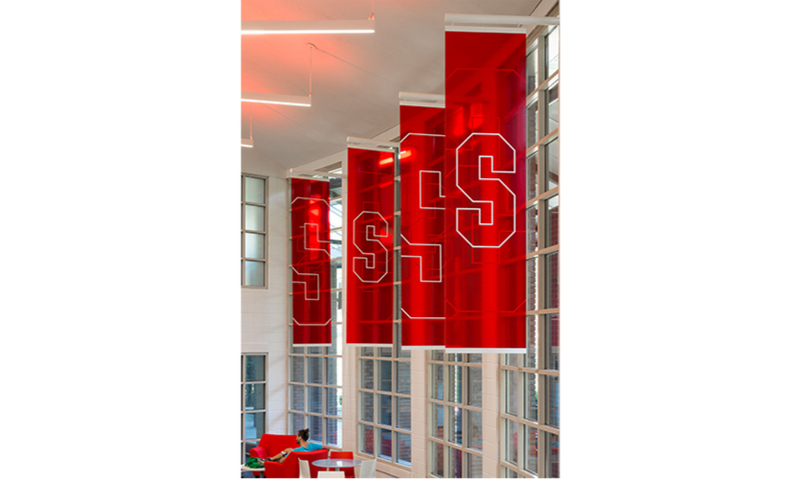 Plexiglas banners in the school colors highlight the large windows and cast a red glow across the space. Lighting design played a big role in bringing energy into the space. The backlit Hall of Fame graphics can be easily updated. The America’s Cup (logo) is inspired by it’s namesake and famous sailing race founded by the Stevens family. 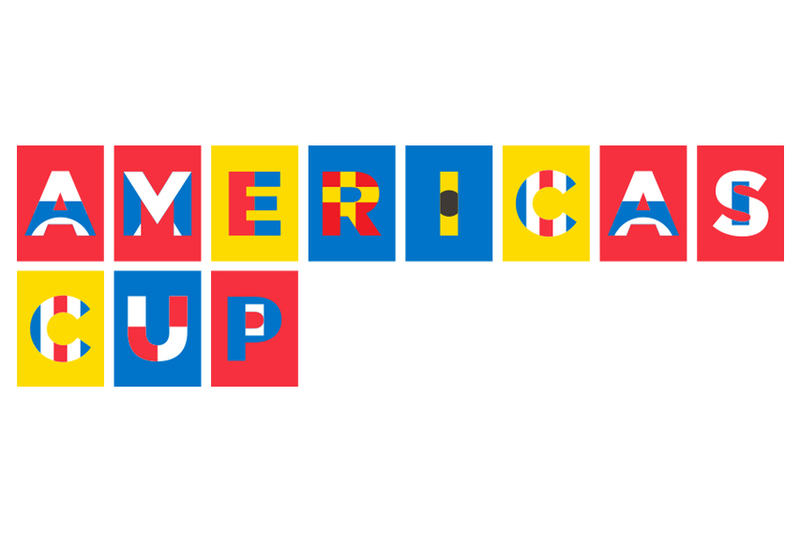 Maritime signal flags form the letters of “Americas Cup" in the official university typeface Trade Gothic. The Spagnola & Associates team worked with the school’s archivist to research the history of the America’s Cup Race. The graphics they developed for the coffee shop have since been used by the school on promotional items like t-shirts, mugs and posters. Tony Spagnola of Spagnola & Associates (New York) posits that positive professional relationships enhance good design—and it’s certainly the case with the firm’s work for Stevens Institute of Technology in Hoboken, N.J., where one project led to two more, then another five. The last six years have seen Stevens navigating a period of reinvention and rejuvenation, with President Nariman Farvardin and “enrollment czar” Vice President for Enrollment Management and Student Affairs Marybeth Murphy at the helm. (2) Part of their plan to elevate Stevens includes physical changes to the university. Stevens is in the midst of a major, multi-year process to renovate existing and construct new buildings on campus. 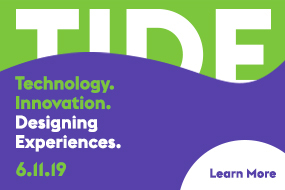 “It is important for us that these spaces benefit from consistent and attractive graphic design to portray a true message about our technologically focused and vibrant institution,” remarks Farvardin. 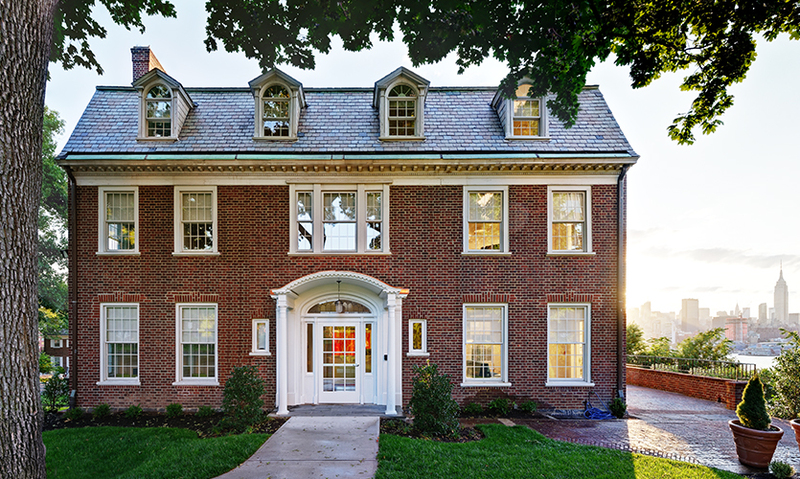 The Ruesterholz Admissions Center was one of the renovation projects topping Marybeth Murphy’s list. Doug Moss, of Holzman Moss Bottino Architecture, who Spagnola has known professionally for years, introduced him and the design firm to Murphy, kicking off the collaboration. The success of that first endeavor led quickly to projects in two other spaces under the Student Affairs umbrella: Schaefer Center Gymnasium and America’s Cup, a café on campus. Those three have, in turn, led to five more projects on campus. The work on campus has brought spaces to life, selling itself. Without using Stevens' logos or colors, they are able to showcase the university’s brand in a creative and memorable way. 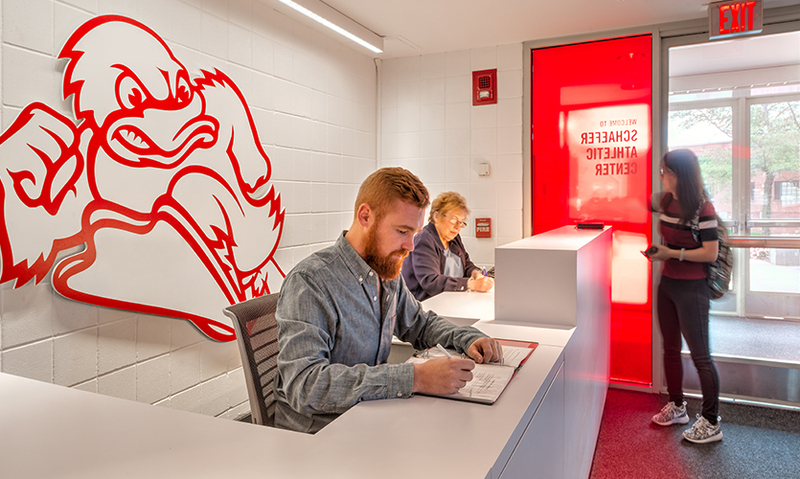 “In our Ruesterholz Admissions Center, we combine our rich history while giving prospective students and their families an idea of where we are headed,” says Murphy. The Ruesterholz Admissions Center was once a single-family home, built around the turn of the century. It was gutted, with some architectural details like the period stairwell and living room preserved, with the express purpose of becoming an admissions center. 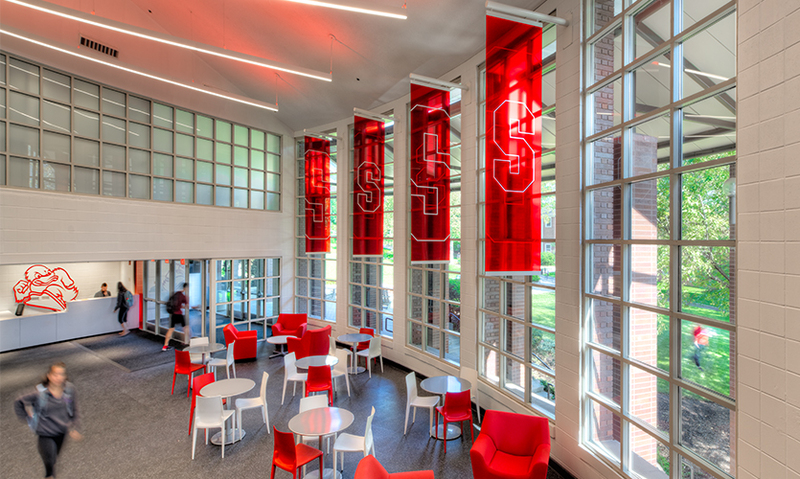 The architect’s vision was to modernize but preserve some of the ambience of the house and the goal of the Spagnola team was to develop exhibits and wall graphics that highlight Stevens’s history, current student life and notable alumni. Having done many visitors center projects, they felt confident in the ability to deliver a 10-minute overview of the college experience. 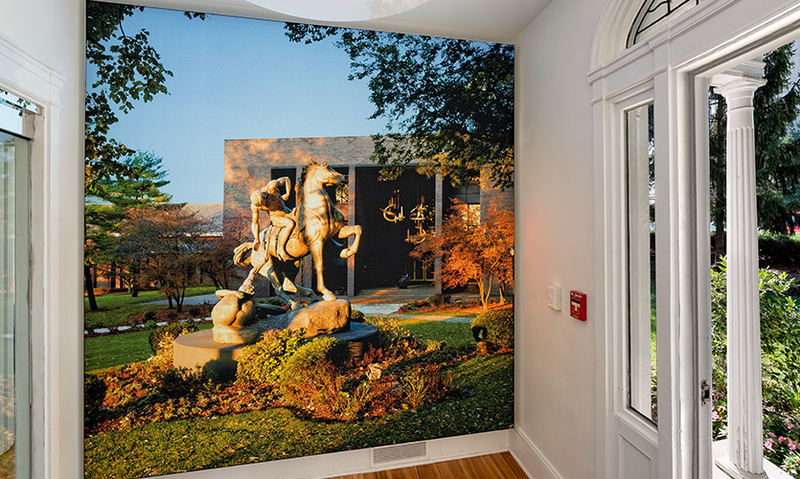 In the entrance of the space, a large backlit fabric mural glows—big and bold, day and night—and peeks through the front windows. The photograph of campus is simple to swap out and is intended to change with the seasons. The main exhibit is hung in the living room, purposely to retain a bit of the feeling of hanging artwork in a home. 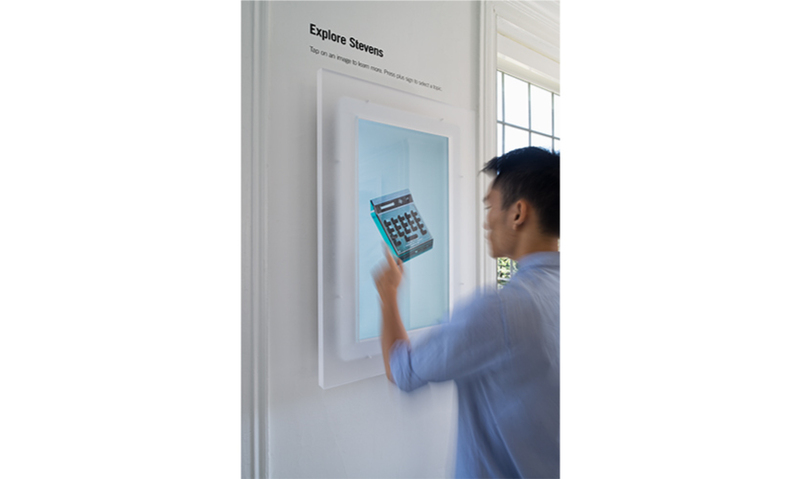 The design team has created not only an overview of the history of Stevens, but also the ability to do a more in-depth investigation into topics like sports and clubs and their histories through the use of touchscreens. Another goal of the project was to honor alumni in this space—so that future students can appreciate the successes of their predecessors. Spagnola had an instant inspiration the first time he saw the space: “The stairwell in the admissions building felt so much like one in a house. 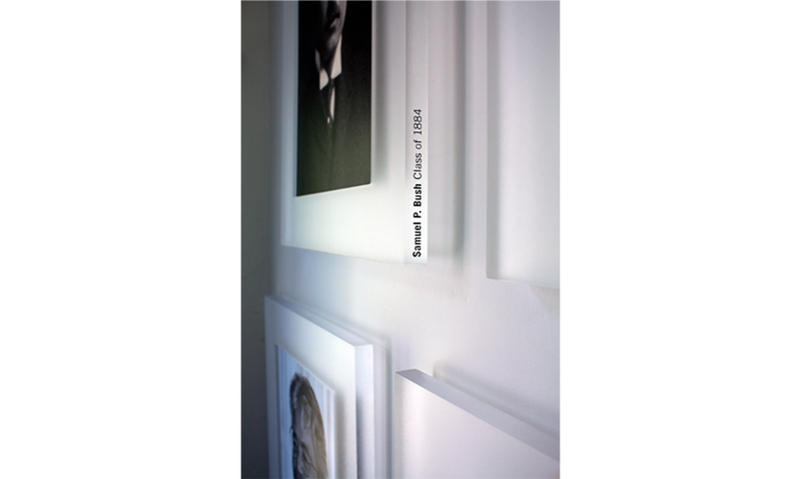 People often put photos of family there, it was a natural thing.” The school selected notable alumni and the design team framed their portraits using Lightblock material, which picks up ambient light, giving a floating feel. Upstairs are interview rooms, which were originally bedrooms. The architects had the idea of specifying different color furniture in the rooms and there was a strong client desire for some sort of branding in the rooms. 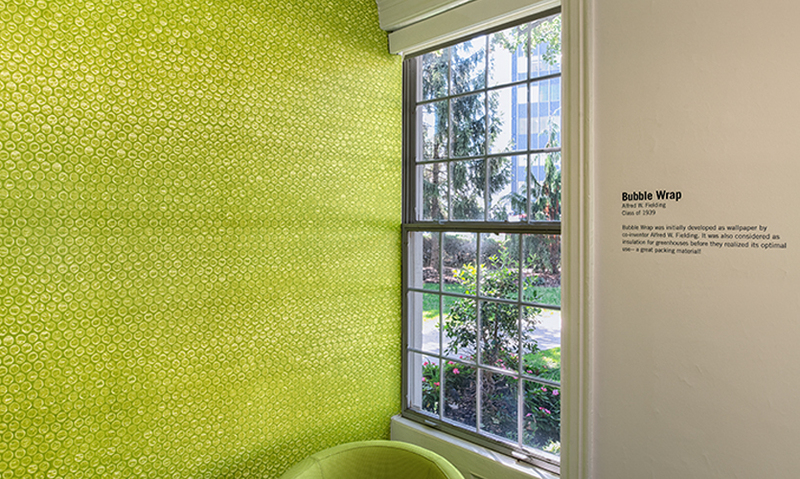 The design team conjured the image of what Spagnola affectionately calls “grandmother wallpaper.” The concept was to echo that sentiment using the color theming to make the contributions of alumni come alive. 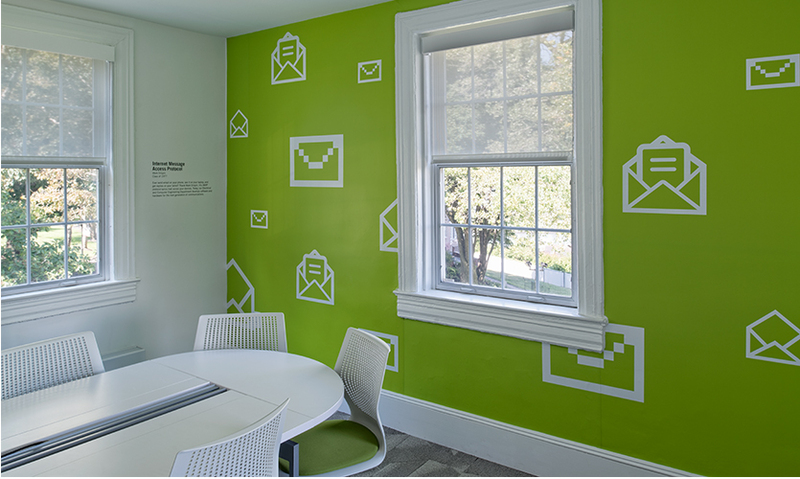 Each of the rooms is treated with a one-wall printed vinyl graphic representation of a contribution of the alums. 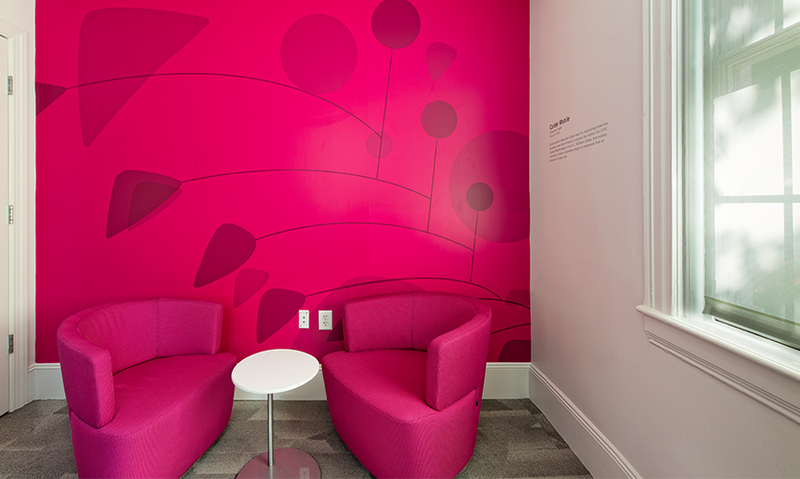 One has a Calder sculpture depicted in pink tones, another showcases the diaphanous texture of bubble wrap (the inventor is an alum) in vivid greens and the Email Protocol Room is the Skype interview room where the mural functions as a background for those interviews. The graphics they developed for the Admissions Center walls have since been used for promotional materials for the Admissions Department. “The reaction from the campus community was overwhelmingly positive. We heard comments like ‘every building on campus should look like this,’” remembers Murphy. The Schaefer Center Gymnasium’s equipment has been updated over the years, but the atrium and entry spaces of the building definitely had not. The Stevens group wanted space not only for informal pre- and post-game gatherings, but also the ability to host large events there. 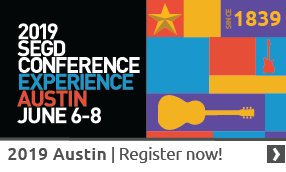 The Spagnola & Associates team was challenged to deliver a bold branded solution in only 16 weeks. They worked closely with the Stevens Student Affairs and Athletic Department to understand how best to promote the public face of the Athletic Department. The first step for the design team was to address lighting issues, as the enormous windows created a greenhouse-like heat and the light in the space was largely unbalanced. The project kicked off with the tinting of the windows to control sunlight and heat and allow for some dramatic lighting effects. Flooring was also updated and the walls were painted white. The next considerations were branding, materials and the flow of the space. Attila, the school’s mascot, found a new life behind the updated reception desk. Herman Miller-seating was specified red to match Stevens’s colors and pop against the charcoal rubber flooring. 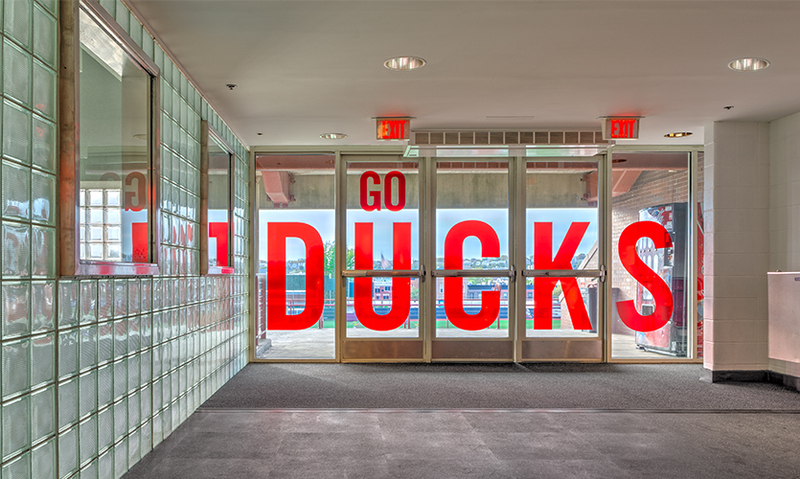 The Spagnola & Associates team designed translucent Plexiglas banners covered in red film, emblazoned with large and small “S” characters that hang in the large windows, refracting red light throughout the atrium. 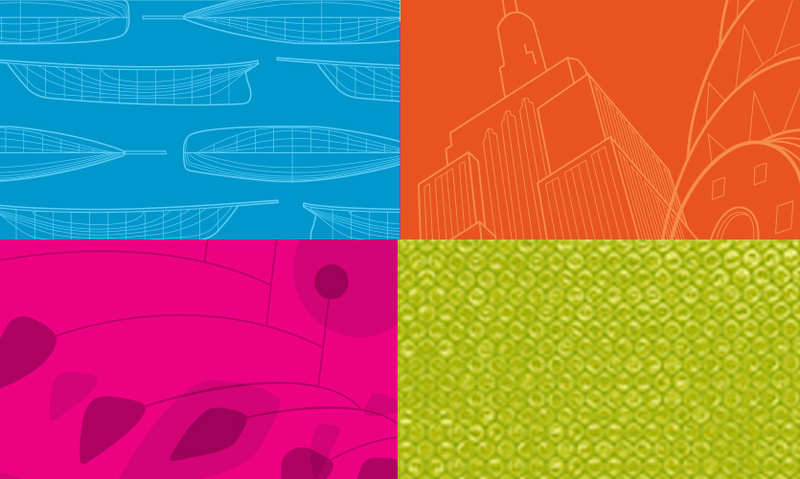 The banners look dynamic, shifting as the viewer’s perspective changes. The unique combination of materials used engages and peaks the interest of engineering students. Over 100 years of athletic achievement are honored in the Hall of Fame, which was updated with rear-illuminated curved glass panels coated with changeable printed graphics. Stevens’s colors are bright and boldly represented graphically and with a big light element above, washing the ceiling in red light, drawing visitors through the space. The atrium space is now one of the most popular places on campus to relax, meet and hold large events. Stevens has made the facilities open to Hoboken residents, as well as students as a way to give back to the community. 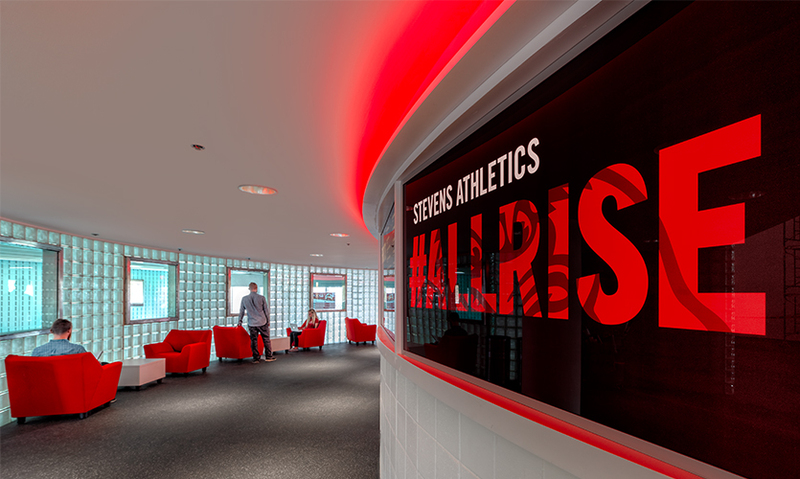 “The Schaefer Athletic Center lobby uses more traditional athletic branding but in new ways: with lighting that can be red or white, graphics that echo the graphics on the field, transparent banners that play with the light and an innovative new way to display awards and trophies,” beams Murphy. America’s Cup, one of the campus’ three coffee shops, was a very non-descript space—and no one seemed to know what it was named for—but it remained a high-traffic area that hosted small performances. Murphy asked Spagnola & Associates to find a way to activate the space in a way that would also explain its provenance and link to the school. The budget was modest, and there could be no architectural changes to the space. 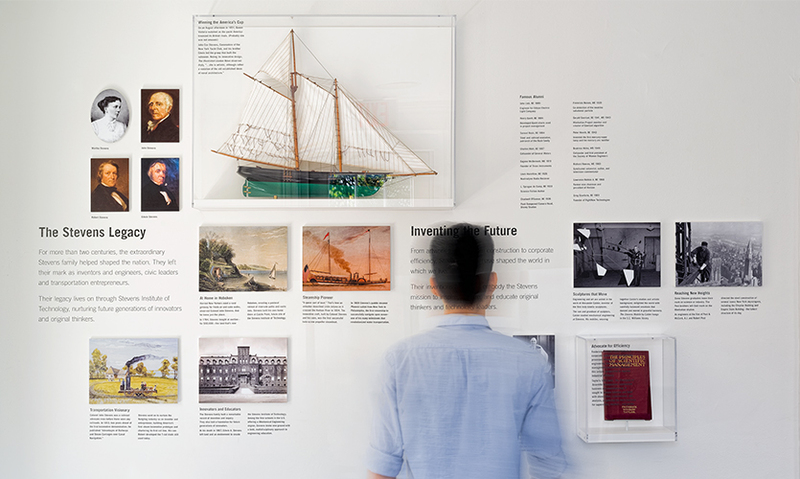 The design team began with research and ideation, working closely with the school’s archivist to discover the history of the America’s Cup race. The school also is home to nautical engineering and boat building facilities. The design team’s goal was to create a branded nautical graphic solution that wouldn’t feel obvious or trite. They began by taking the America’s Cup race logo and replacing the anchor with a coffee cup—a bit tongue-in-cheek—but exactly the kind of visual needed to help make the visual connection between race and café. For the walls, the team looked into signal flags, but felt that using them to spell words was somehow expected, so they used the letterforms from Stevens’s typeface and created posters of the letters overlaid with the signal flag colors and forms in vinyl adhered to the wall with small reproductions of the full signal flags below. They also updated the lighting and added colorful chairs that also have a nautical legacy (they were originally designed for the navy). 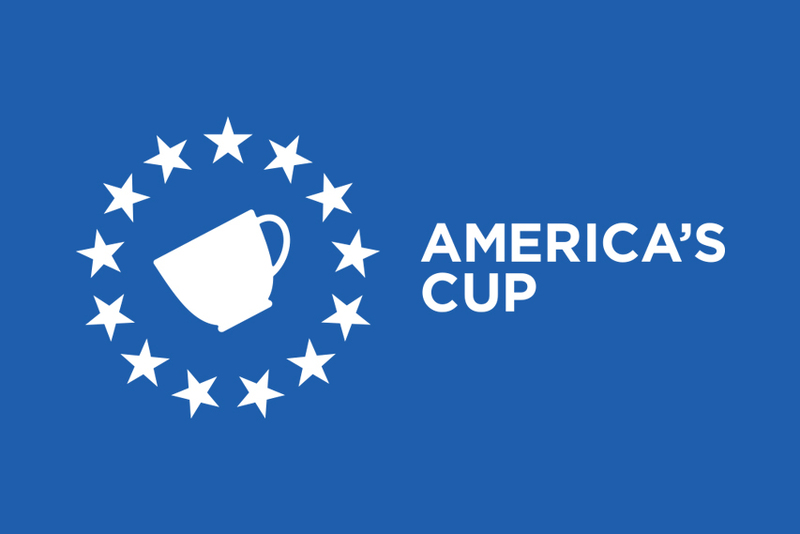 America’s Cup has become the most popular coffee shop on campus, and the graphics created for it have been translated into Stevens branded merchandise like mugs and posters. “The design of our cafe, America's Cup, again brings our history to the space in a new way. 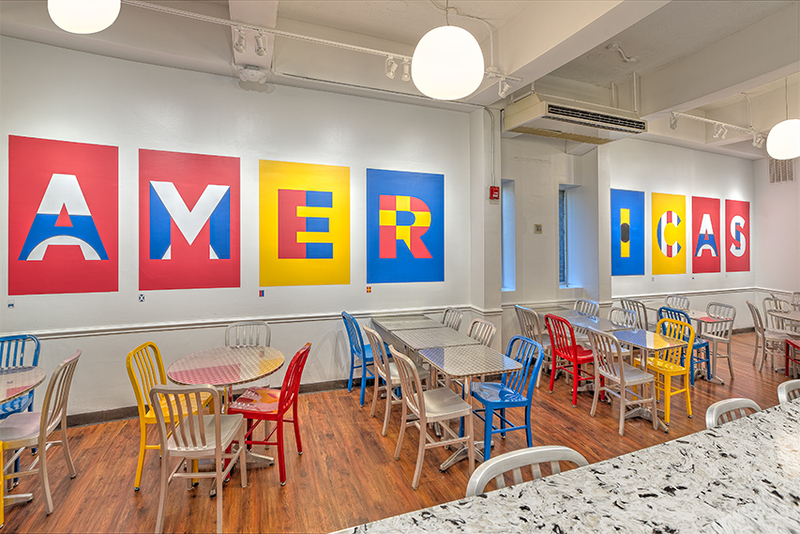 Bright, and inviting, the space uses color and graphics to highlight the role that America's Cup has played at Stevens,” remarks Murphy.